Generally, installing IntraWeb it is a very simple process. This process has improved from previous versions and generally you just need to remove the previous version and install the new one. Sometimes you may need additional steps and we will describe here detailed information about the IntraWeb installation process. If you are a bundled user (License information) or had purchased a license, you must read this document. Remove the IntraWeb Bundled edition (the IntraWeb version that comes with Delphi/Rad Studio). To do that, follow the instructions here. Note: if you are uninstalling IW 10 and prior, also check for SW* files. Check for IW DCPs and BPLs in your HDD (Intraweb_100_*. *, IntrawebDB_100_*. * and dclintraweb_100_100*. * for IntraWeb 10, Intraweb_110 etc.. for IntraWeb XI and Intraweb_120 etc.. for IntraWeb XII) and remove these files. Check Delphi folders, My Documents, Program Files, Documents and Settings, Windows, etc... Only remove the files for the Delphi version you want to install IntraWeb. Run the installer you just donwloaded and paste your key when the installer asks for it. If you are using a bundled key (which is IDE specific),Â be sure to not choose a different IDE or more than one IDE, as it will turn IntraWeb into Evaluation mode for both IDEs. Please note that each IntraWeb version has its own license version. After supplying the key, press Next and the installer will install IntraWeb in the chosen folder. After the installer has finished, we need to check a few settings to ensure the installer process was successful. Open the IDE and check if RAD Studio/Delphi Library Path includes the correct location of the new IW files (the path you choose for installing IntraWeb). Modify it if needed. 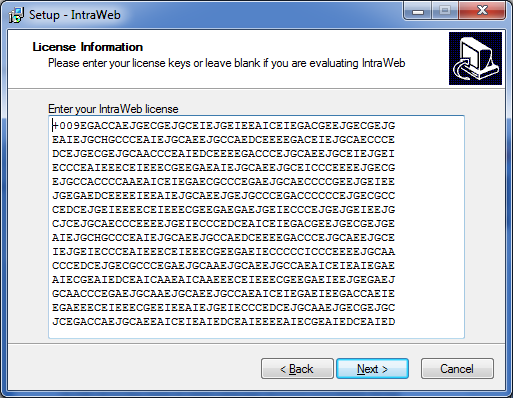 The installer will generated file name IWLicenseKey.pas in the folders you choose to install IntraWeb. For XE2 32 Bits, the folder name is LIBXE2W32. Open this folder and check if your IWLicenseKey.pas file includes your personal license. Compile one of the demos (Features is a good sample) or create a new Stand Alone Server application and check the IW version in the log window. Now, the log window must show you the correct IW version and that it is registered and working properly. For a list of problems you may find and how to fix them, please check the install FAQ.